Tales are emerging form Brazil that Edson Arantes de Nascimento, better known to most of us as Pele, may have derived his famous name from where other than the influence of an Irish Christian Brother from Kerry. Pele was born in Três Corações, Brazil, the son of a Fluminense footballer Dondinho. His initial nickname was Dico. Thankfully that didn’t stick. Just doesn’t have the same ring about it, does it? 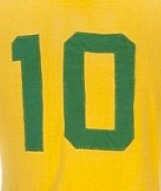 Carlos Alberto, to Gerson, to Jairzinho. Goooooooooooaaaaaaaaaaaalllllll. Brother Ambrosius O Se from Kerry was stationed in the Mission in Três Corações. A keen scholar of Irish and naturally a follower of gaelic football, he was fascinated with the skill levels of the local Brazilian youth. One such player was the boy wonder Edson. He approached Br Ambrosius one day and asked him could he play with the ball that the good Christian Brother was kicking nonchalantly against the wall of the school and catching as it flew back to him. ‘Futebol’, shouted the young Edson. ‘Futebol’, shouted the young Edson again. ‘Peile’ again replied Br Ambrosius in great humour altogether. This went on. From there the name Peile stuck. Edson was happy he was no longer called Dico, of course he was, and he has made his name as the greatest foreign games player ever. It was eventually shortened to the more familiar Pele. Br Ambrosius? He was last seen coaching sailing up the Amazon on a Steamboat, smoking a large cigar and sipping a Caipirinha. His fame made as the man who named Pele, however accidentally. He is the toast of Brazilians who wax lyrical whenever his name is mentioned.